courses in the United States. 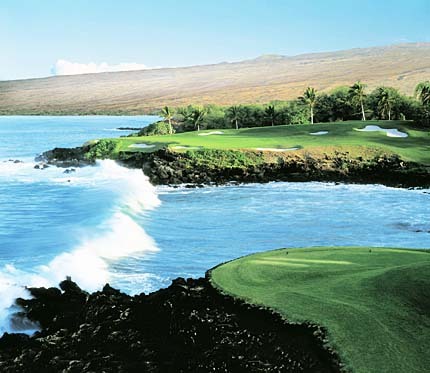 The Mauna Kea Beach Golf Course on the Big Island's Kohala Coast has for years claimed its place as one of the top 100 courses in America, as ranked by Golf Digest. Opened in 1964 and named after the 14,000-foot snow-capped volcano that crests overhead, the Mauna Kea Beach Resort was conceived and built by New York financier Laurence Rockefeller, who brought in acclaimed architect Robert Trent Jones Sr. to design the golf course. Jones responded with one of his most formidable achievements, carving out a 7,114-yard masterpiece from a lava-strewn wasteland. Jones' courses have the reputation of being rugged tests of golf -- and Mauna Kea is no exception. Not only is it long and buffeted by wind, it has 120 strategically placed bunkers. The fairways dip, twist and roll, following the contours of the lava, while the greens are elevated, slick and undulating. Mauna Kea has been modified since it opened in '64. In 1975, Jones' son, Robert Trent Jones Jr., was brought in to redo several of the greens, which were considered to be too severe. About a decade later, the course created a variety of alternate tee placements to reduce blind shots and help make the course more enjoyable for golfers of different playing abilities. Otherwise, the layout retains its original character, taking the golfer from sea level to the heights above the Mauna Kea Beach Hotel, where the ocean and the volcano are almost always in view. The resort's signature hole is the par-3 third, a postcard one-shotter across a surging Pacific inlet. When golfers ask about the third, they are often told it is the easiest par-3 on the course because it has recorded the most holes in one. From the back tees -- and this hole has six sets of tees -- the third is a tiger: a 210-yard carry into a crosswind to a green guarded by seven bunkers. What's more, the 180-foot-long green is undulating, two-tiered and angles left toward the ocean. Varying pin placements can require the golfer to softly fade a long iron to reach a plateau on the green's right back flank, or to deftly draw one to reach the green's left neck. Interestingly, the third hole once measured 250 yards. This was when Mauna Kea hosted the 1964 exhibition, "The Big Three," featuring Arnold Palmer, Jack Nicklaus and Gary Player. During the practice round, Player failed in repeated attempts to clear the water and told officials, "If they play from this tee, it will be without me." Needless to say, Player stayed. The tee didn't. It has not been missed. Mauna Kea's par-3 third ranks among the world's great ocean holes. Like the course itself, it tests the true measure of a golfer. When you think you are pretty good, you take your game up to Mauna Kea and see if it will hold up. for courses throughout Hawaii on Sunday.